Even though this movie isn't about Coffin Joe, it was a creation of writer/director/actor José Mojica Marins. 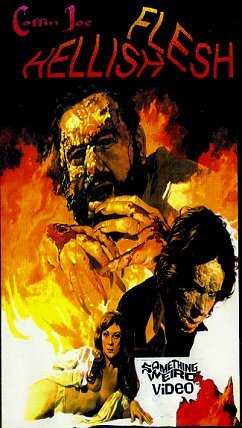 This full color film from 1970 revolves around George Medeiros (Marins), a scientist trying to create an acid that can dissolve a human body. His wife Rachel plans to kill him with his own acid so that she can run off with her lover, Oliver. She throws the acid in his face, sets the lab on fire, and leaves her husband for dead. George survives, although disfigured, and plots his own sweet revenge on Rachel. When José Mojica Marins went to have eye surgery done in real life, he took a film crew along. The actual footage of his eye been sliced and worked on are added to the film as part of George's surgery after the "accident." Back to Coffin Joe Movies.